Canadians need to hear the aboriginal perspective. Join our story. Support us! Call 519-445-0868, Monday – Friday, 9 am – 5 pm (Ontario). Please include with your cheque your full name, return address, phone number and email. Please indicate whether you would like your contribution to remain anonymous. Interested in making a larger contribution? You can by cheque as outlined above, or if you’re interested in offering a matching contribution, give us a call and help us reach out to other Canadians by showing you support a Canada that includes all voices and supports indigenous journalism . Contact us by at abm @ phone 519-445-0868 or fax to 519-445-0865. Support Aboriginal Business and bring aboriginal voices, facts about aboriginal issues, our hurdles and our success stories to the national stage. Join the conversation for fact based reporting on indigenous stories from the people who live the stories….help us bring the aboriginal voice to the national conversation. 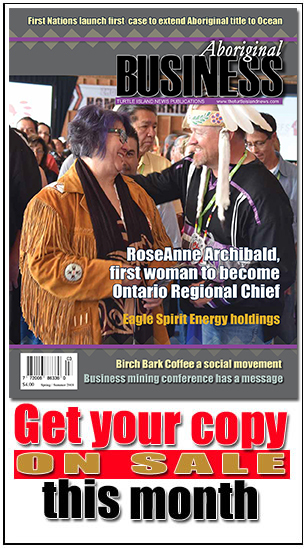 We are an independent, aboriginally owned online news magazine and print edition from the Grand River Territory of the Six Nations in Ontario who are passionate about first nation issues and providing you with reporting based on the facts and analysis from the people that live these issues. 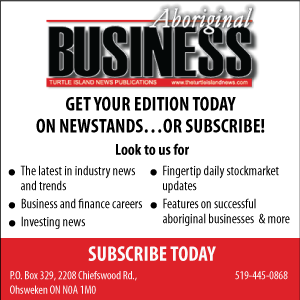 Aboriginal Business Magazine is part of the Turtle Island News Publications and Multi-Media company that is 100% First Nations owned by veteran award winning aboriginal journalist Lynda Powless and her sons. Lynda has been part of the mainstream reporting scene winning numerous national newspaper awards and has brought that expertise to covering issues that affect her people, the indigenous people of Turtle Island to Aboriginal Business Magazine and the national award winning Turtle Island News, the flagship publication of her now 20 year old publication company. A company she built from the basement of her home at Six Nations of the Grand River to today’s award winning business. She has won national business awards and was named one of the Top 100 Business women in Canada. You can join our story by helping us give voice to aboriginal issues. It isn’t business as usual anymore. Supreme Court decisions have changed the way both business, industry and government will develop whether its housing developments, oil refineries or pipelines, First Nations now, by law must have a say in projects being built on lands they have an interest in. With those changes Canada needs to hear the aboriginal perspective that is not being told by national media that is losing its way as government continues to muzzle or control information on First Nations issues while giving unprecedented influence to business and industry in development of First Nations lands. With a federal election coming and a country puzzled over a new way of doing business has to include First nations it’s time for the indigenous voice to be heard. It’s time for the facts on indigenous issues, analysis and business. Join us in helping to bring the indigenous voice to the national conversation A conversation that supports a Canada that includes indigenous people voices. Sign up as an Aboriginal Business Magazine (ABM) supporter and support indigenous journalism. Your support helps us to provide jobs and assignments for journalists to cover the national aboriginal stories that the national media doesn’t miss…it doesn’t know they exist. As an ABM supporter you can tell us what kind of stories you want to read, what issues you want clarity on. Fill out our news-survey letting us know what you want to see. With your support we will be able to keep ABM paywall free! You will have access to the entire website and as a special Nia:weh/thank you for signing up you will receive our quarterly print edition. Your support will not only help us provide you with the facts, and one of those facts is reporting costs money. Help us make indigenous voices part of the national conversation. Support ABM. All ABM transactions are processed in Canadian Dollars. You can change the amount you’re giving us monthly or stop subscribing at any time. For questions or cancelations contact us by email or phone (519)445-0868 and we will cancel your membership, which will take effect the next time a payment is due to be made.